It's been over 2 years, but the European Beer Challenge on Beer O'Clock Australia is finally back! This review is coming to you live from our balcony in Vaduz, Liechtenstein's capital city. It may have taken ages to get here, but for this moment it was totally worth it! The Principality of Liechtenstein is one of the world's smallest countries at only 160km2. Since 2007 they've had a craft brewery of some repute, with Liechtensteiner Brauhaus winning a number of awards in Germany. I've been waiting a few years to get my hands on this, so let's get into it! 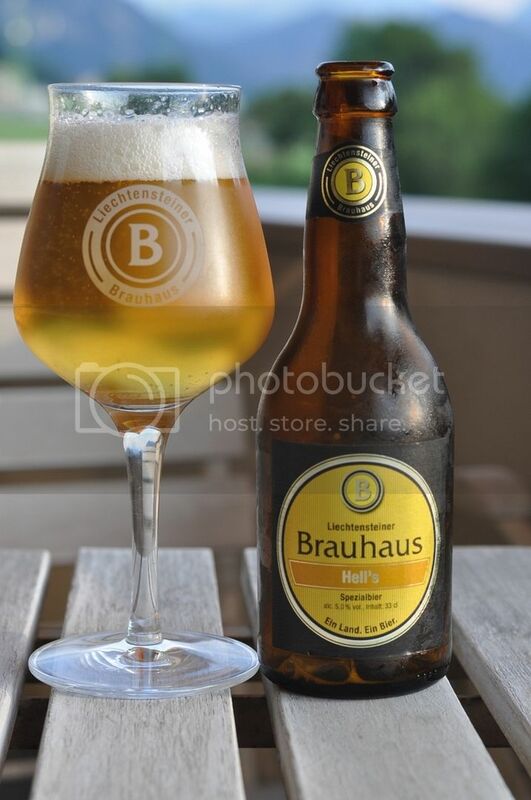 Liechtensteiner Brauhaus Hell's pours a light golden colour with a medium sized head of white, highly aerated foam. The bulk of the head fades quickly, but half a finger was left throughout the majority of drinking. It even laced the glass, which has been a rarity for lagers in recent days... This is also one of my favourite beer photo's I've ever taken, the one I'll take back home might not go ahead of it... You'll have to check back in two or three weeks and find out if it did. Onto the nose and it's particularly enticing. The grain bill is slightly sweet, albeit expectant for a Helles, as well as having good fruitiness and a touch of lager yeast. The fruitiness of the hops in particular excited me, with clear signs that these guys knew what they were doing when they brewed this and didn't just do it on the cheap. The taste lived up to the nose; it was an excellent example of a Munich Helles Lager. The malts were sweet, in a good way, and provided more than enough balance to the hops, which had grassy and fruity characteristics. The fruit was nowhere near as strong to taste as the aroma had indicated. Liechtensteiner Brauhaus Hell's was light and easy drinking and a beer I'm looking forward to trying again at home, when my bottle makes it back safely!